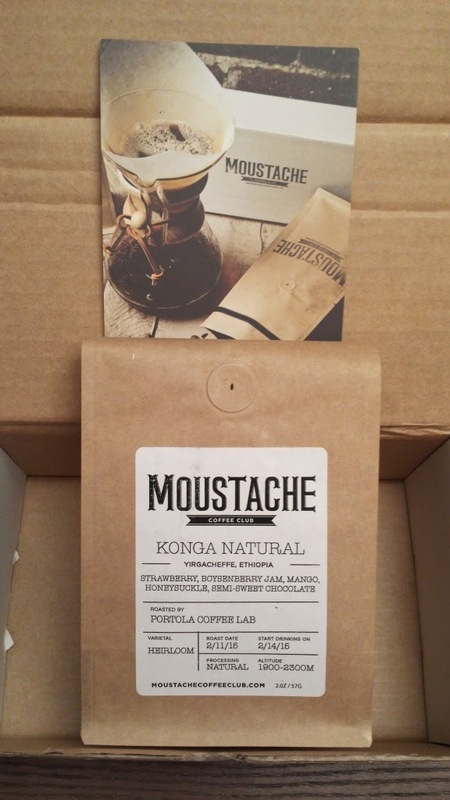 Through another blog (and I'm sorry but I do not remember which one) I stumbled across the Moustache Coffee Club. The nice thing is that they will send you a 2oz sample of coffee beans to try before you sign up for the subscription service. Any direct (or near as) quotes from their site will be in italics. Here are their options for subscriptions (basically the difference is the frequency). Each of these options cost $19 shipping included. You can easily skip a shipment or 2 if you need to. Just log in to your account and follow the steps - easy peasy. They ship single-origin coffee beans only and work with roasters in the Los Angeles area. Single-origin coffee is coffee from a small geographical area, usually a particular farm or small group of farms. It is significant because the characteristics of the region, the soil, the altitude and the aspect (what wine lovers call terroir) all heavily influence the final flavor of the beans. Because the coffee all comes from a small area and usually one single farmer, the quality of the coffee can be controlled to a much higher degree. Here is the coffee I received. It is Konga Natural from Yirgacheffe, Ethiopia. The roaster was Portola Coffee Lab. As you can see the label has information about taste notes, when it was roasted, what process, what altitude (? - I don't understand but I am somewhat of a neanderthal when it comes to refined palate stuff). What I do know is that the aroma and taste of the coffee is wonderful. I used the burr grinder and used it for my (gasp) refillable K-Cup in the office. I expect if it can taste good there it can taste good anywhere! And it is... good. So I signed up for the Lip Syncer program. That's enough for me right now. I am quite excited to see what else they have in store for me! If you are interested in subscribing, please do me a big favour and use my link, you'll get $5 off. Much appreciated.